We feel this is an extraordinary instrument, offering the best price/performance ratio in the market today. It readily affords a competent and professional assessment of HF exposures between 800 MHz and 2.5 MHz (3.3 GHz), and with the optional antenna (UBB27), assessment down to 27 MHz. From a building biology perspective, this particular frequency range is especially relevant in today’s wireless world because cellular phones, cordless phones, microwave ovens as well as next-generation technologies (such as UMTS/3G, Bluetooth, and WLAN) all make extensive use of it. Other monitors do not analyze RADAR and 3G/UMTS-FDD signals as carefully, and with the option antenna’s abilitiy to detect down to 27MHz means that other signals, such as TETRA/Airwave, will be detected and analyzed. 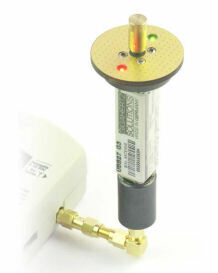 Frequency-compensated logarithmic-periodic antenna (800 MHz-2500 MHz (3300 usable, with extra tolerance) included. Please look to the bottom of this page for an image of the optional Ultra Broadband Antenna. 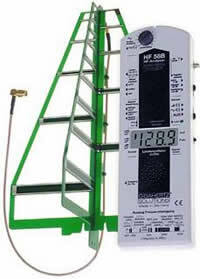 For measurement of signal frequencies above 27 MHz (which includes CB radio, analogue and digital TV and radio, TETRA etc. ), this compact quasi-isotropic Ultra Broad Band Aerial with a range from 27 MHz to far into the Gigahertz range. (Provided as standard with our HFE35C and HFE59B, and as an optional extra for our HF59B HF/Microwave Analyzer). This increases the sensitivity of the meter by a factor of 10 (10dB). Used with the UBB27 antenna on HFE35C, and with all models HF58 and HF59. Active quasi-isotropic ultra broadband antenna.